Lately I discovered that my shirts have been occupying the back end of my wardrobe, quite literally. Especially after starting full time work the shirt almost relates to a rigid and stiff corporate dressing option sans the fun. But I was glad I could see the fun side of a shirt thanks to my latest brand collaboration! Hawes and Curtis sent me some of their most unique, classy, tailor made shirts to come up with some style ideas and I must say right from exploring the shirts on their website to receiving them in the mail I have been nothing but impressed! 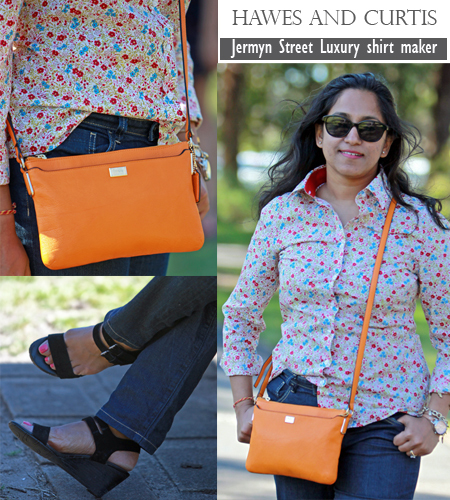 Floral classic fit shirt- Hawes and Curtis (gifted) | Dark wash denim- Esprit | Crossbody bag in tangerine – Coach | Watch – Fossil | Bracelets – Banana Republic and J Crew | Sunglasses – Ralph Lauren | Sandals- GH Bass & Co.
Hawes and Curtis is a UK based Jermyn street luxury shirt maker offering free shipping and returns to Australia, now there’s a fair reason to start shopping. And if it has made you keen, wait till you have a look at the incredible variety of patterns and colours they offer in a range of fits. 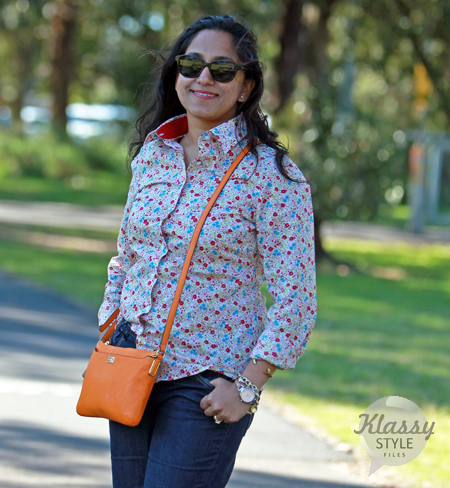 You get to pick from fitted, semi- fitted and classic fit shirts for work or leisure. You will be spoiled for choice! Its been a while since I have seen such fine and meticulous packaging, I realised straight away after I opened the brown box! The fabric of the shirt is superior, the cut is flattering and finer details such as the contrasting red panel on the inside of the collar gives it a nice edge. The floral pattern is delicate, lively and very pleasing to the eye. 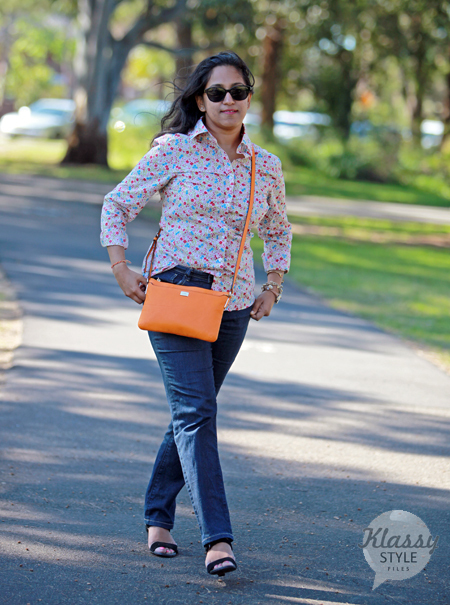 The fit is relaxed yet stylish and the button spacing is just perfect. 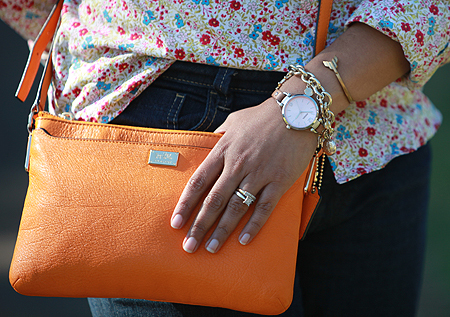 I softened up the look with a messy tuck into my dark wash jeans and paired it with a bright orange cross body bag for a perfect Spring look! 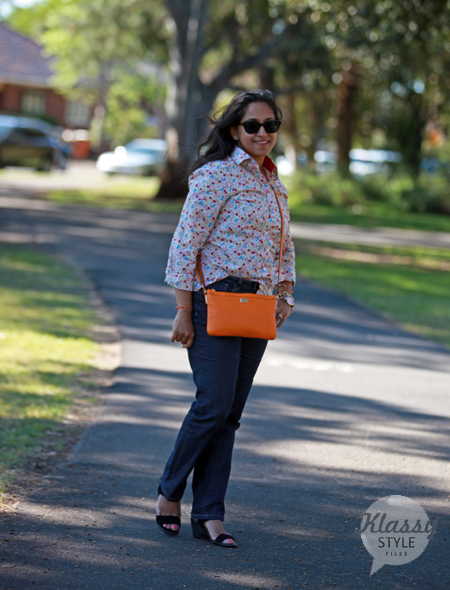 The floral shirt takes center stage paired with classic pieces like the jeans and black wedge heel sandals and the bright bag adds a great pop of colour without taking away from the vivid print on the shirt. And before I leave you to hop on to Hawes and Curtis I would like to mention that they offer an equal if not better range of shirts for men, so include your better half in the shopping plan and also check out added extras such as timeless wool knits, classic shirt dresses and structured leather work bags and purses. Note: This is a sponsored post. This shirt was sent to me by Hawes and Curtis for product review and promotion. However the opinions expressed in this review are my own.